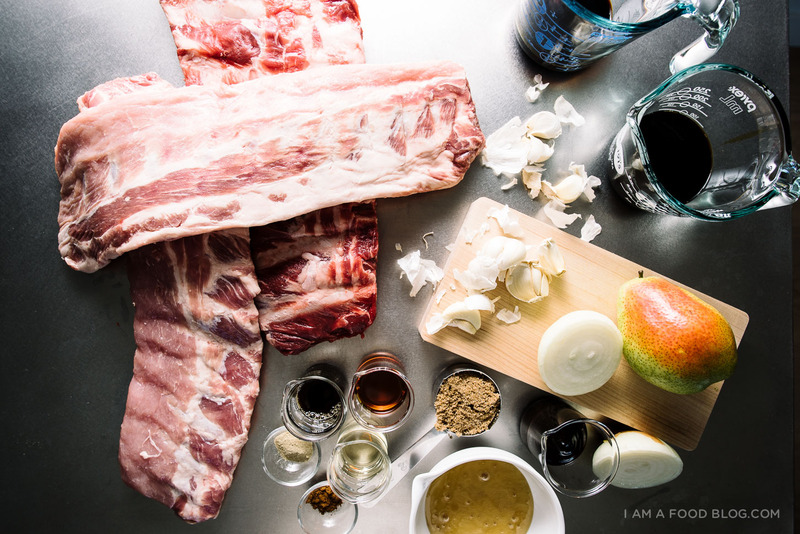 Recipes → entertaining → Slow-Cooked Baby Back Ribs Dinner Party! One of my dear friend’s birthdays is coming up and since, on his actual birthday, he’ll be up in the air, unable to make it to a celebratory dinner party, I decided to throw him one early. I take birthdays very seriously. I think it’s because I like to make a big deal out of mine. I’ll plan out the perfect day (I always try to take the day off work, if I can), focusing on the food of course, I’ll even take a look at making sure that my dining table set is perfect for when it comes to serving a meal for him. Birthdays are the one day a year that you should throw all your inhibitions away and eat yourself into a happy (birthday) food coma. Happy birthdays should always include food. I think food is one of the things that makes people truly happy, so when I cook for people, I always worry about what I’m making. There’s usually double pressure too, because I want to please myself and the person I’m cooking for (and Mike, so I guess that’s triple pressure?). I always pay attention to food loves and aversions, but this particular birthday dude is one tough nut to crack. He’s pretty stoic when it comes to food: he likes eating, but he’s never really stated what it is he really likes eating, aside from this one crab dinner he had in Osaka years ago. I entertained the thought briefly, but there’s just no way that I can do a Osakan crab dinner, so that was out. Thankfully, one day, he randomly mentioned that he never had home cooked ribs before. Mike and I were aghast because, ahem, I’m kind of a ribs master (not really, heehee). So ribs it was! And with the ribs I made some mac and cheese waffles (so, so good), a simple salad, and a big pitcher of summery sangria. Dessert was a classic chocolate cake with a dinosaur figurine for extra birthday love. But, you know what? I have to admit, as much as I love cooking things people want to eat, it’s even better when what they want to eat is something that makes it easy for me. 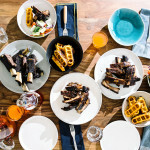 Ribs are the best dinner party dish: you can make them ahead of time, they’re delicious, and they’re kinda sort of impressive in the I made a boatload of meat sort of way. Ribs are one of the easiest dinner party dishes, I feel. And, bonus, when you eat ribs with friends, you really know that you’re family. Who else would you eat so savagely with, ripping meat of bones, getting your hands all up in the food, sauce all over your face. 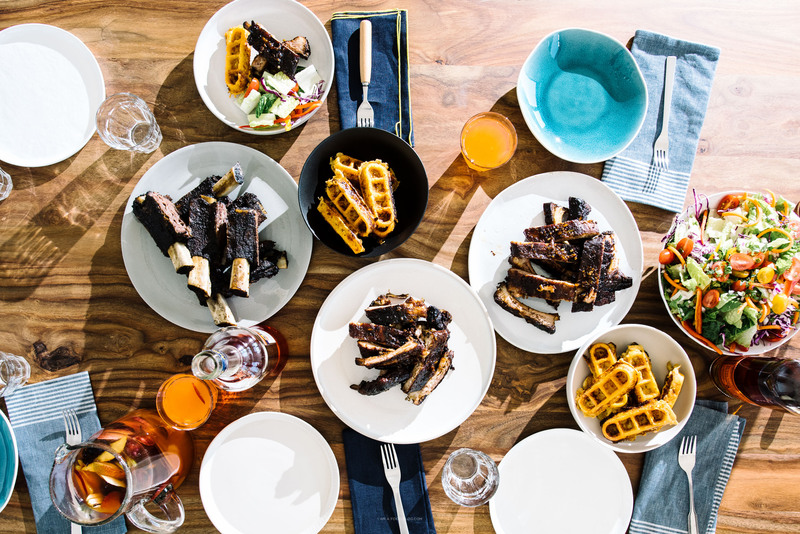 You know that when you invite someone over for ribs, what you’re really saying is: hey, let’s eat some food with our hands together. You can be your real self and forget all about utensils, I won’t judge you. On to the ribs! I made three kinds, but I’m only providing one recipe here. 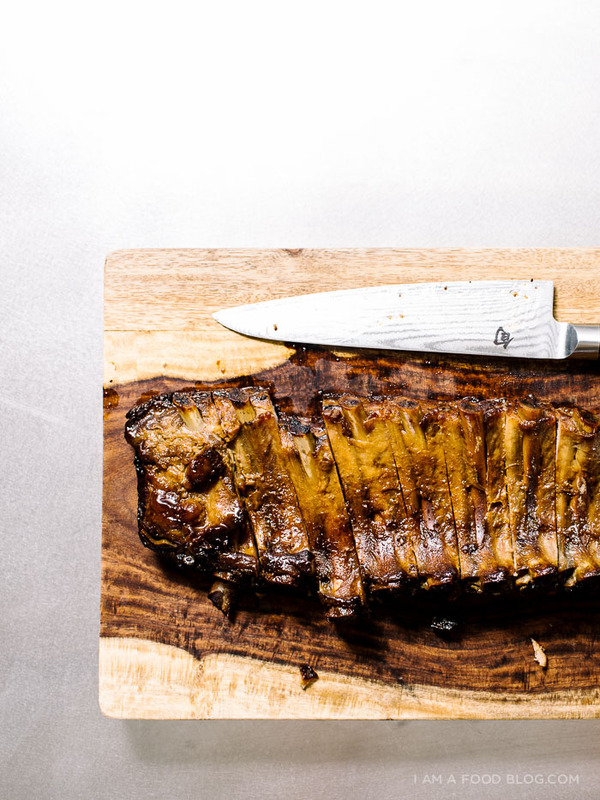 One of racks was kalbi baby back ribs, which you can find the recipe for right here. There was also a giant rack of beef ribs too, but I used a rub, and let’s face it, a ribs recipe with a rub isn’t really a recipe at all. The last rack of ribs I made was a take on Chinese char siu. 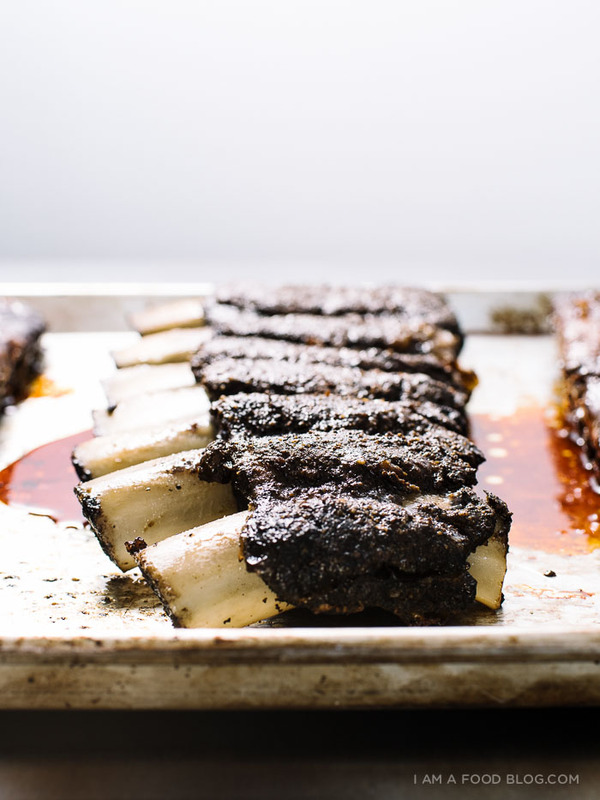 They were sticky, slightly sweet, ultra savory and just fall off the bone. They happened to be the favorite of the bunch, so they’re pretty much a winner. If you like char siu (and who doesn’t?) 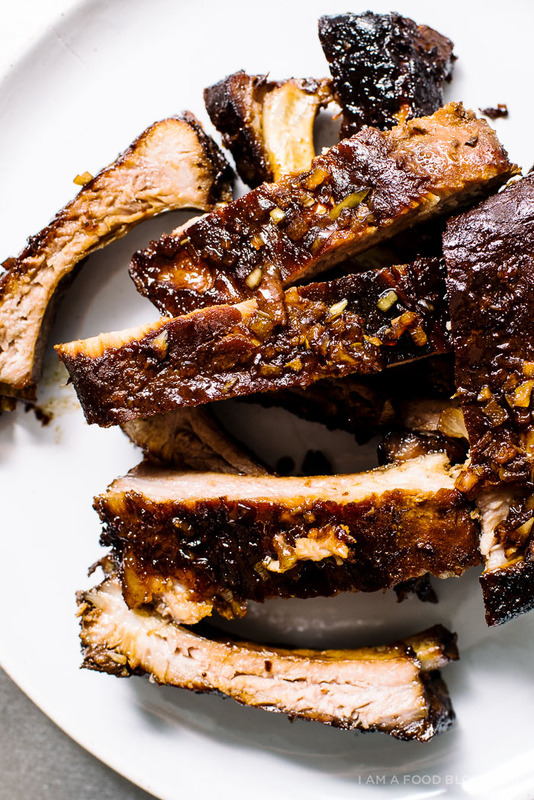 you’ll love the flavor of these ribs. I’m happy to say that my little dinner party was a success: we ate ourselves silly into a happy food coma and I think my friend liked the food. He didn’t say as much, but he did have second, maybe even thirds of everything. Happy birthday Bruce – may this one be the best yet! If there’s a thin membrane on the back of your ribs (when the ribs are placed meaty side down) loosen and remove. Place the ribs in a deep baking dish, meat-side down. Combine the honey, hoisin, sweet soy sauce, black vinegar, five spice, white pepper, sesame oil and garlic in a small bowl, mixing throughly. Pour over the ribs making sure all surfaces are coated. Marinate for at least 4 hours or overnight. When ready to cook, preheat the oven to 325°F. Remove the ribs from the marinade (reserve the marinade) and wrap the ribs (again, meat side down) tightly in foil. 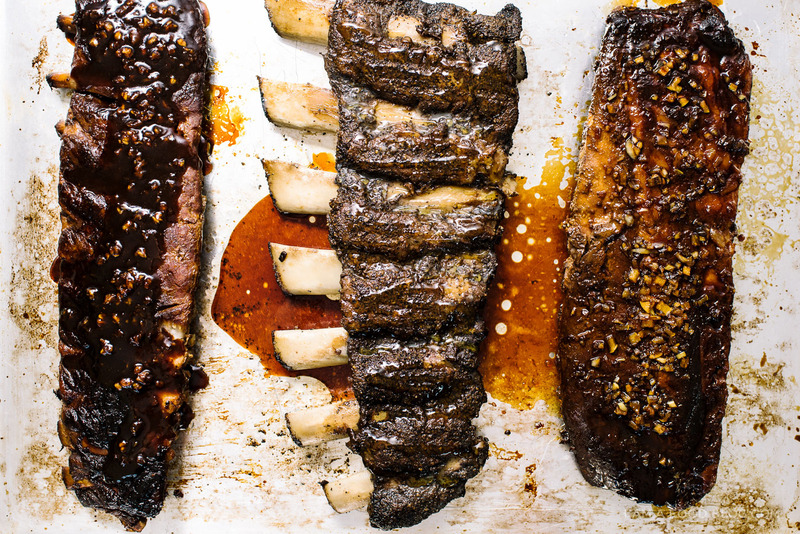 Place the ribs on a deep baking sheet and bake for 2 and a half to 3 hours. When the ribs are done, they should be fork tender. Fifteen minutes before the ribs are done cooking, put the reserved marinade into a small pan. Bring to a simmer over medium-high heat and then turn down and reduce slightly until the sauce is sticky and slightly thick. Remove the ribs from the oven and carefully unwrap the foil. Carefully place the ribs back onto the baking sheet (they should be very tender so be careful when moving them) and brush on some of the reduced marinade. Turn the oven to broil and broil until a deep brown, 3-5 minutes. Remove from the oven, flip so the ribs are meat-side up and brush on more of the marinade. Broil until deep brown, about 3-5 minutes. Keep an eye on the ribs as they are broiling as oven temperatures vary. Remove from the oven, slice (it may be easier to slice with the ribs facing up) and garnish with sliced green onions, if desired. Enjoy! Notes: If you want to make the ribs the day before and just chill out on the day of your dinner party, I’ve got you covered. 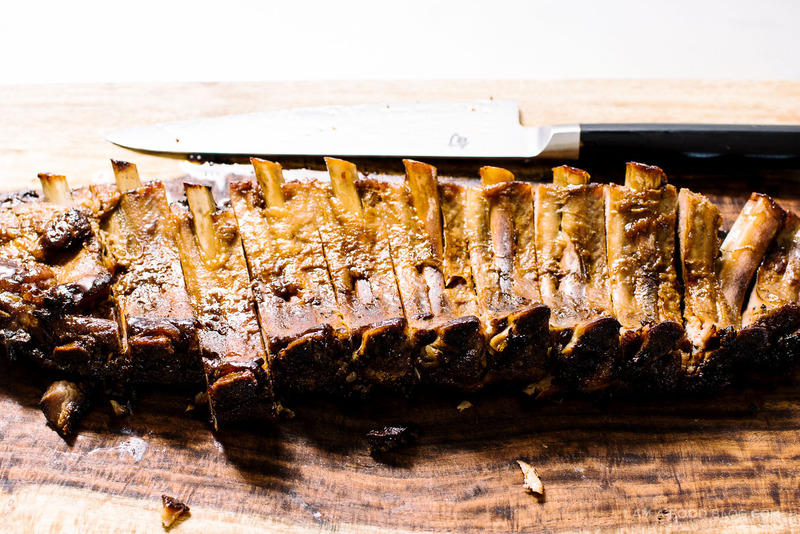 All you need to do is hold your ribs right after you slow-roast them. Remove them from the oven, let them cool in the foil and then double wrap them in an extra layer of foil, making sure that the seal is air tight. I like to saran wrap them as well for good measure. Then pop them in the fridge. The next day, about and hour before you’re going to eat, bring the ribs out of the fridge and let them sit at room temperature. Unwrap the saran wrap, if you used it, and place them on a rimmed baking sheet. Preheat your oven to 300°F and warm the ribs for 20 minutes. Remove and then follow the instructions above from the point when you’re going to broil and glaze. PS – I made a salad for this dinner too, but didn’t do a post on it because, salad. But apparently it was one of the best parts of the meal, so maybe I should do up a post on how to make salad? These guys are part of a Slow Cooked Baby Back Ribs dinner party. Check out the mac and cheese waffles, sangria, and chocolate cake too! Ok best part was the THREE TYPES OF RIBS part because holy overachiever. I’m pretty sure I’m not alone in saying that you’re pretty much the best friend a friend could ever have. 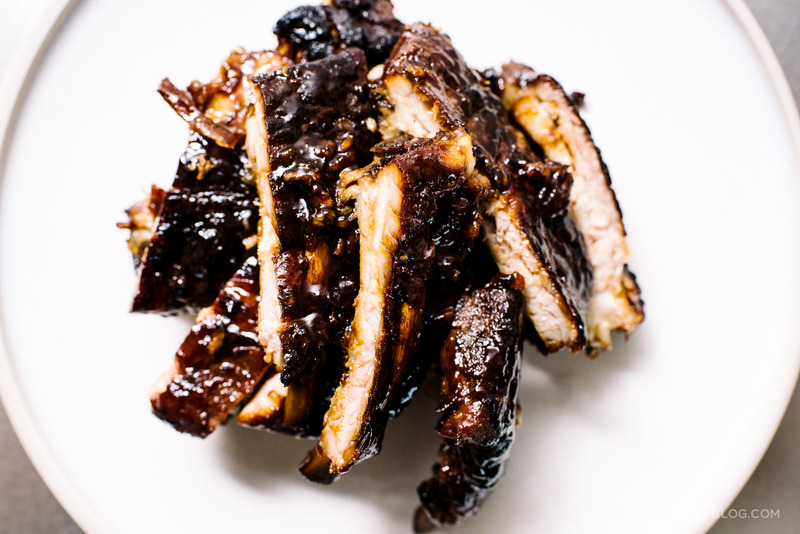 And CHAR SIU RIBS? 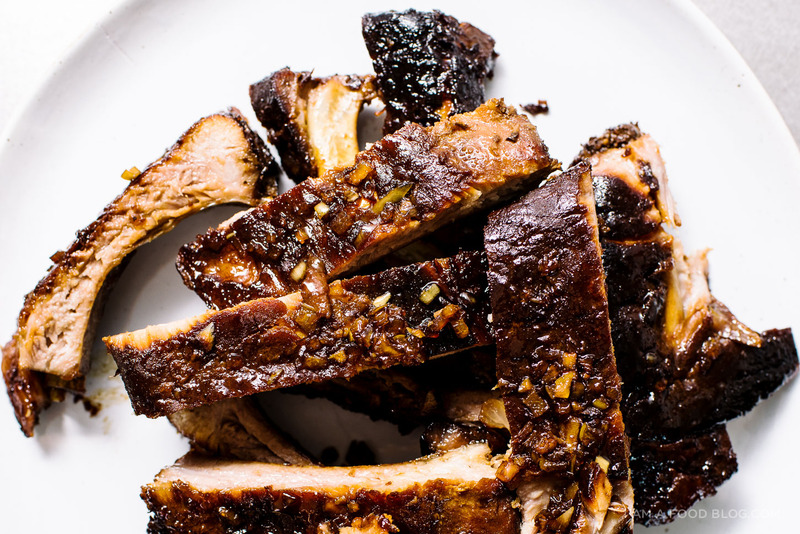 I love love love anything char siu and these sticky ribs look like all kinds of meaty awesomeness. Let’s eat ribs together so we can be family, ok? My mouth is watering! Those ribs look so tender and flavoursome! Please do share the salad. Sure, salad might seem simple, but there’s a lot that goes into an exquisite one. This looks so good. And that top spread is just such a beautiful photo!!!! 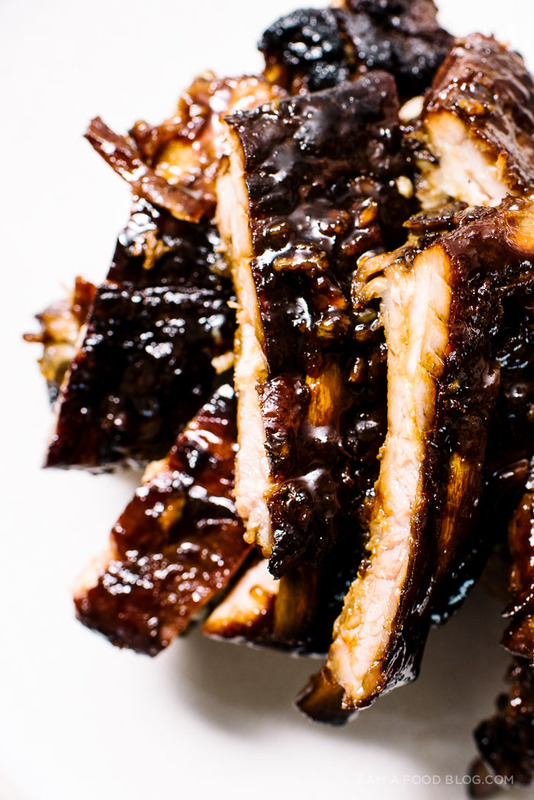 CHAR SIU BABY BACK RIBS. OMG. This entire series of recipes has pretty much made my entire week. Your friend is one lucky duck, Steph. I second Alana — best friend EVER! Hello! If I were to adapt this for the Instant Pot, do I cook the ribs in it then broil it in the oven with the marinade? Thanks! I wanted to say that I made this ribs recipe twice using IP. First I cooked the ribs in water and the second with the marinade. I prefer cooking the ribs in water and brushing the marinade prior to broiling. It made for tastier ribs. :) Thanks for sharing the recipe again!